France has made it illegal for supermarkets to waste food. Italy is offering tax breaks when businesses donate leftovers. In Canada, $31 billion worth of food ends up in landfills or composters each year. But a policy addressing our food waste isn't likely to be in place any time soon. Other countries crack down on discards, so why are we so far behind? France has made it illegal for supermarkets to waste food, and Italy is offering tax breaks when businesses donate leftovers. But a policy that addresses food waste in Canada won't be in place any time soon. In Canada, $31 billion worth of food ends up in landfills or composters each year, according to a 2014 report from Value Chain Management International. It's part of a global problem where 1.3 billion tonnes of food gets thrown out each year, according to the Food and Agriculture Organization of the United Nations. Yet 850,000 Canadians use food banks every month. CBC Marketplace spent six months investigating the food thrown out by supermarkets. Marketplace staff found dozens of bins full of food behind two Toronto-area Walmart locations. Canada won't be serving up any food waste solutions for at least a year. "Food waste is part of the food policy that we're going to deal with in the next year or two," Agriculture Minister Lawrence MacAulay told CBC News. But the minister wouldn't say whether reducing waste would be a priority in that food policy, saying it would be "inappropriate" to do so before stakeholders were consulted. "In 2017, we will be open to discussions in public right across the country. Anybody involved — nutritionists, food groups, retailers, perhaps seniors homes, whatever — anybody that can add to the policy is [who] we want to hear from." Previous efforts to put food waste on the government's radar have failed. Earlier this year, NDP MP Ruth Ellen Brosseau introduced a private member's bill about the issue. It was presented for second reading at the beginning of October, but was defeated. The Fight Against Food Waste Act asked the government to work with provincial politicians to set targets for reducing food waste, which would, in turn, lower methane emissions. Watch the Marketplace investigation on food waste at 8 p.m. on Friday, Oct. 28 on CBC Television and online. It also called for an education program to let consumers know how much they are wasting, since 47 per cent of food waste happens in the home, according to the Value Chain Management International study. "I know the government is going to be working on a food strategy, so we're really hoping that when [MacAulay] starts consulting for this food strategy — this vision for agriculture — that he does include something for food waste because it's really important that we act," Brosseau said. She said she thinks Canada is "really, really far behind" other countries in tackling food waste. 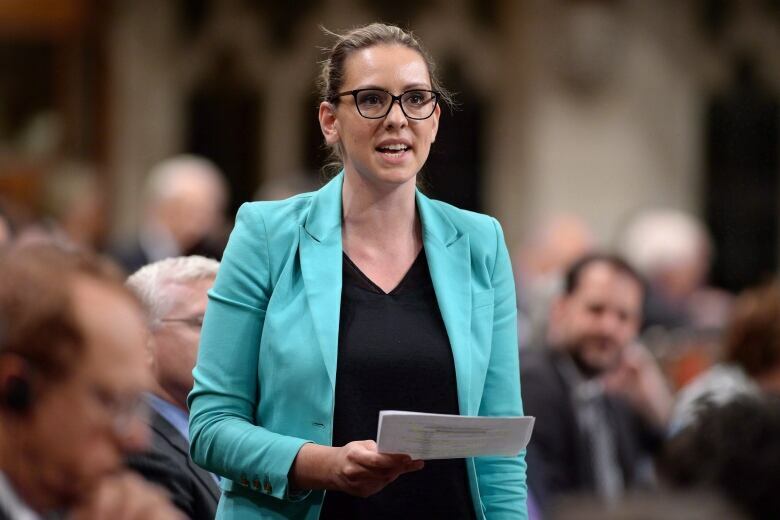 NDP member of Parliament Ruth Ellen Brosseau introduced a private member's bill this year to set targets for reducing food waste. (Canadian Press)"Looking at what happened in France, it's just amazing what they've done. There are so many actions that the government could take, but I think first is realizing and admitting it's a problem," Brosseau said. Getting stakeholders to the table and setting targets for tackling waste would be a good first step, she suggested. Meanwhile, other countries are starting to take the issue seriously. Earlier this year, France banned food waste, forcing supermarkets to sign agreements with charities so no edible food ends up in the trash. Italy's Senate has passed a law that makes donating food easier for businesses and offers tax credits to supermarkets and farmers who donate. While the U.S. doesn't have national regulations for food waste, federal legislators are working to make best-before dates more understandable so that less food is thrown out. And some U.S. states are tackling waste. In 2014, Massachusetts banned businesses from wasting food. California did the same this year. Internationally, the UN has made cutting food waste one of its sustainable development goals, adopted by world leaders and signed onto in 2015. The goal is to cut retail and consumer food waste in half by 2030. Where legislation has been slow, activists, charitable groups and entrepreneurs have tried to pick up the slack. Toronto's Second Harvest has been a mainstay in "food rescue" throughout the years. The organization, which has been delivering fresh groceries to those in need since 1985, provides donated food to more than 200 agencies. Flashfood, an app in beta testing, aims to connect shoppers seeking a discount with food that would otherwise end up in the trash. Users would order food through the app, then pick it up from a store or restaurant. And there are groups like Not Far From The Tree, another Toronto-based project that will harvest fruit off trees at local homes and donate the extra yields to those who need it.